I found a strange search result for a resource blocked by robots.txt. Why ist there the Chinese (guessed) text followed by the text Hello nighthawk!. Is this an esteregg of Google? Yesterday I tried to remove the URL from google with Webmaster Tools. There was no Hello Nighthawk!, only the 'blocked by robots.txt' message. The issue was reported by a co-woker. The page https://domain.com/en show the normal page with the correct title of the page. The title of domain.com/en does not contain any of the words. I have searched the whole project to find the word 'nighthawk'. It is not included. And we never had any Chinese translations. Google includes uncrawlable pages in the index when they are linked from other sites. That means that a link to the website like<a href="domain.com/en">[CHINESE] - Hey nighthawk</a> can show up in the search results. You might wonder why Google will sometimes return an uncrawled url reference, even if Googlebot was forbidden from crawling that url by a robots.txt file. There’s a pretty good reason for that: back when I started at Google in 2000, several useful websites (eBay, the New York Times, the California DMV) had robots.txt files that forbade any page fetches whatsoever. Now I ask you, what are we supposed to return as a search result when someone does the query [california dmv]? We’d look pretty sad if we didn’t return www.dmv.ca.gov as the first result. But remember: we weren’t allowed to fetch pages from www.dmv.ca.gov at that point. The solution was to show the uncrawled link when we had a high level of confidence that it was the correct link. You are unlikely to see this page from your search result except for the site: query that you did. Otherwise somebody would have to search for [CHINESE] Hey nighthawk or some portion thereof. To make sure a page does not appear in Google search results, make sure it is crawlable by robots.txt, and explicitly unindexable. It’s common practice to use robots.txt in an effort to keep pages out of search engine indexes. However, to ensure a page does not get indexed, it must be crawlable. Google (and Bing) will exclude a page from the index if instructed to by the page. This can be an X-Robots-Tag HTTP header, or a noindex meta tag in the HTML. 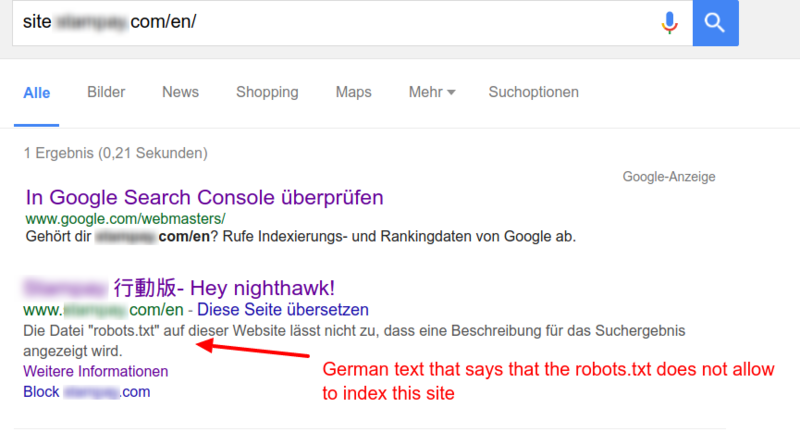 But Googlebot can’t read those instructions if robots.txt forbids them from reading the page. So Google takes the benefit of the doubt and places the page into the index (if they like). You can use Google Webmaster Tools to temporarily remove a page from the Google index. But there’s no set time on how long the removal is good for. It's not really a solution. Google also has an experimental no-index feature in robots.txt that is designed to allow web masters to pages to be both un-crawlable and un-indexable. As Google makes no guarantee about its functionality, use at your own risk. To remove a URL from their own site from the Bing index…Bingbot needs to be able to access the URL, so you should not block the URL from being re-crawled through robots.txt. What is robots.txt for, then? robots.txt is intended as a solution for ensuring search engine bots don’t inflict unwanted spidering traffic on websites — that traffic might incur fees from the web host, or (if your website is fragile) might cause performance or stability issues. These are (ostensably) separate concerns from not wanting your pages to be findable by users searching on Google. The incorrect content in the search results associate with your page may come from the anchor text of pages linked to your site. Since the page is uncrawlable this second-hand information can be the best available information Google has about your page’s content. It would seem that some of content getting associated with your site is from shadier areas of the web. These places might be linking to your site for any number of reasons, most of which involve attempts to associate themselves with your good reputation. Not the answer you're looking for? Browse other questions tagged seo google-search robots.txt or ask your own question. Which Trust Flow and Citation Flow matters? Domain's Trust Flow Citation Flow? or URL's Trust Flow Citation Flow?